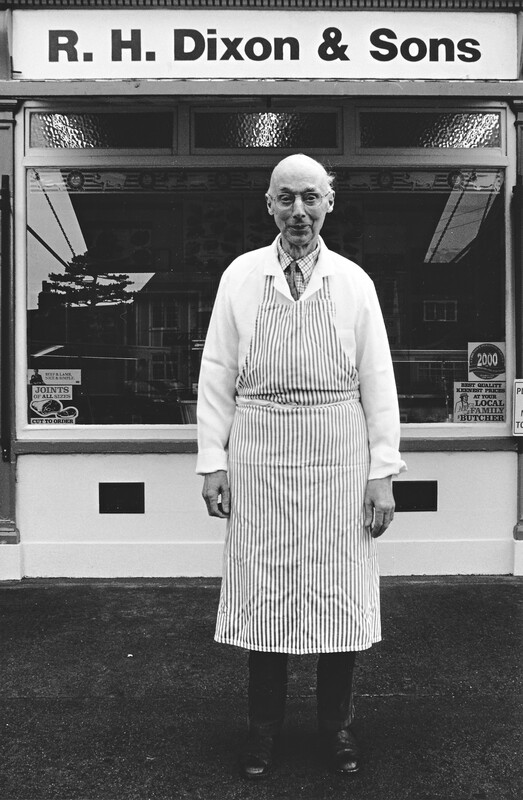 Mr. Geoffrey Scholey Dixon outside the butcher’s shop in Main Street, Bishopthorpe. Photographed in 2000 by Roger Poyser. The small butcher’s shop, with its pleasant blue and white painted frontage situated in the centre of Main Street, is a familiar Bishopthorpe landmark. The butcher’s business, R. H. Dixon & Sons, has served the local community (including a number of Archbishops) for more than a century. Many people still remember Mr. Geoff Dixon who had worked in the shop all his life and died in 2009 aged 95 years. 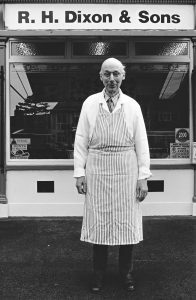 It is not well known, however, that the business was started by a young butcher, George Scholey who arrived in Bishopthorpe about 1869. George was born in 1849 at Kelfield, the son of Robert Scholey, a farmer. In 1873 he married his cousin, Annie, and brought her to his home, in Bishopthorpe. The couple had eight children: six girls and two sons. Unfortunately, the two sons and one of the girls died in infancy. 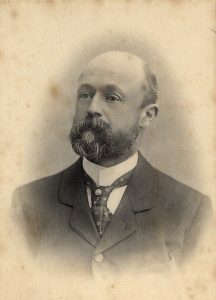 Butcher, George Scholey, became a prominent parishioner taking an active role in local affairs. At the first Parish Council election in 1895, he polled the highest number of votes. Among the local farmers who would have called upon George to slaughter their beasts for market, was Alfred Dixon. Alfred tenanted Moor Farm in Moor Lane, Bishopthorpe. He and his wife, Eliza, and two young children, arrived in Bishopthorpe from Barkston Ash during the 1870s. No doubt the Scholey and Dixon families knew each other well and their children grew up together. Almost inevitably, the eldest son of the Dixon family, Robert Henry, married Edith Annie, the eldest of the Scholey sisters. The young couple married at St. Andrew’s Church in 1907. Sadly, Annie’s father, George, had died only the previous year leaving Robert Henry to run his father-in-law’s butcher’s shop. Robert lost his own father, Alfred, in 1892 and, with his younger brother, Percy, helped their mother, Eliza, to run Moor Farm. Percy, who was born in Bishopthorpe in 1881, continued to run the farm well into the twentieth-century. Geoff’s father, Robert Henry Dixon, pictured outside the family home, Walnut House. Robert Henry married George Scholey’s daughter, Edith Annie, and took over the butcher’s business when George died in 1906. 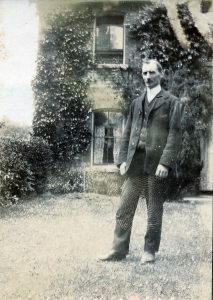 Robert Henry and Edith Annie Dixon settled into George Scholey’s large house, known as Walnut House, situated in the grounds next to the butcher’s shop. The couple had two sons, Arthur and Geoffrey; both boys having been given the middle name of Scholey. The two brothers followed in their relatives’ footsteps and became butchers. Geoffrey did not marry, but Arthur married Hilda Agnes Sandberg in 1942 and it is their son, Robert, who to this day, continues to provide the village with excellent fare. 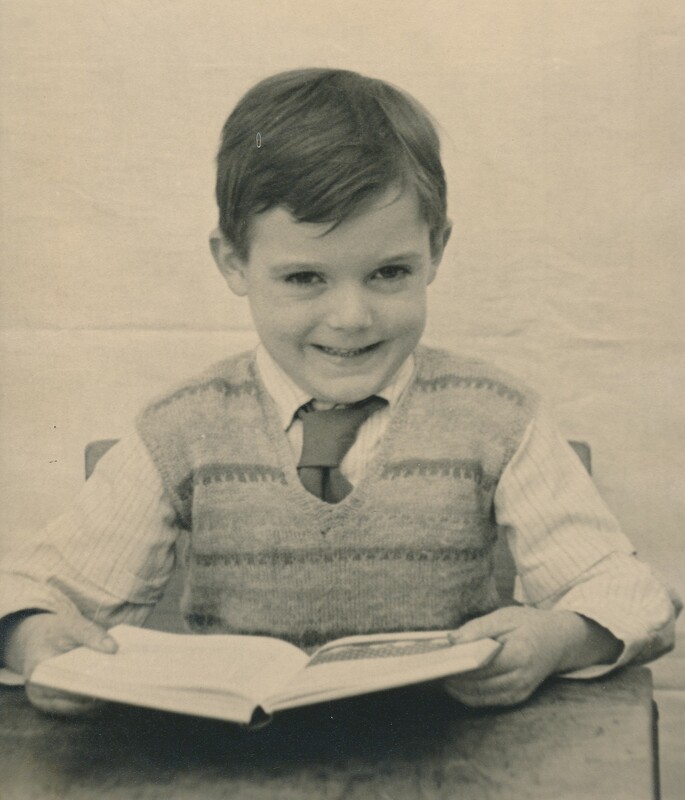 Bishopthorpe Local History Group is grateful to Mr. Robert Dixon for giving his permission to scan and display family photographs.